The new WordPress REST API allow a lot of interesting scenarios, like creating posts from python scripts or other applications. Unfortunately in many cases to access these APIs one needs to install authentication plugins because WordPress natively only supports cookie-based authentication. 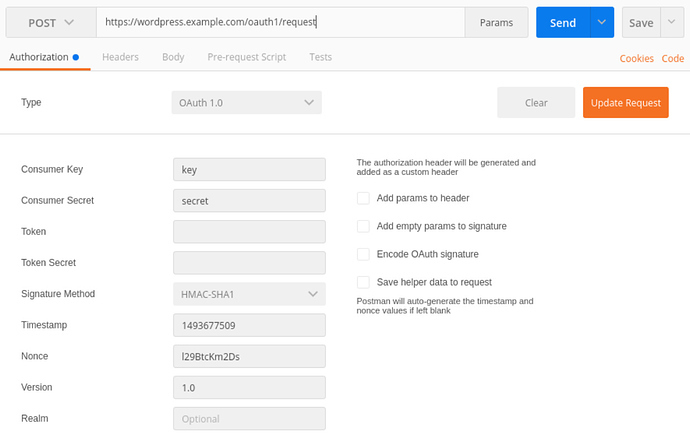 This tutorial covers the steps necessary to authenticate to the WordPress API using OAuth 1.0. To start, install the WordPress OAuth 1.0a server plugin and enable it on your WordPress site, noting that it requires at least WordPress 4.4. After you run this you will see your key and secret. Copy them somewhere safe, you will need them in later steps. Now that you have the client key and secret, you can use that to generate a token to authenticate to WordPress. 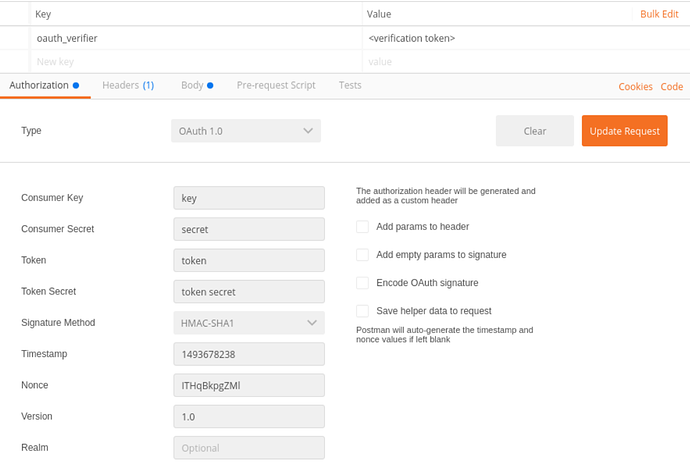 OAuth1 libraries handle the hard parts of this for you, we will be doing it all manually using Postman. Then finally in the Body tab set the content type to x-www-form-urlencoded. Finally in the Authorization tab hit Update Request and Send. Where token and token_secret are the actual contents of your token and secret. 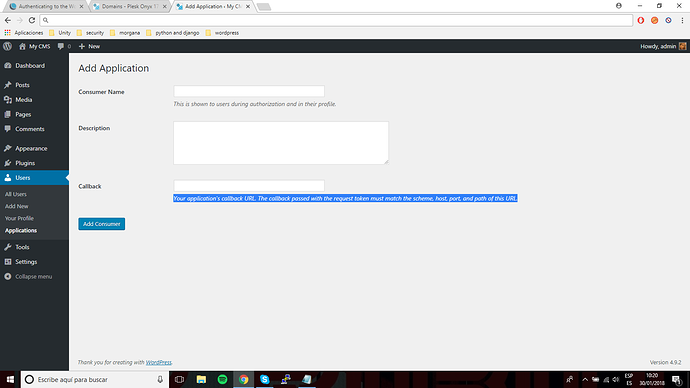 WordPress will ask you to log in as the user you wish to associate these tokens with, if you are not already logged in. Once you authorize the token you will be given a verification token: save this somewhere safe for the next step. Where token and token_secret are the content of your permanent tokens. If everything worked, you now have a token and token secret that you can use to authenticate to WordPress with your OAuth 1.0a app. Create a status key, where the value is the status of your post, possible values are publish, future, draft, pending, private, it defaults to draft. If everything worked out, you should get a response with some information about the post you just created, including the URL to visit it at.? shouldnt we use Oauth2? isnt this a secutiry concern? Is there a WordPress plugin that provides OAuth2 or OpenID Connect? Last time I checked, there wasn’t. I’m also not aware of any security issues with OAuth1.0a protocol itself. If you have more details, please share them. I don’t have a callback URL in my WordPress panel and the sample code works fine. Is your code not working? What error do you get? Also Plesk is not part of the equation, you can just ignore it. Your application’s callback URL. The callback passed with the request token must match the scheme, host, port, and path of this URL. err: Consumer callback is required and must be a valid URL. Using the CLI (not Plesk, which I have never used), the callback url is not mandatory. In any case, it is An absolute URL to which the Service Provider will redirect the User back when the Obtaining User Authorization step is completed. (from OAuth1.0a spec). I have never used that part of the plugin. I wrote this tutorial when I was experimenting with WP’s REST API but never used this plugin in production. Have you tried putting something like https://your.domain/callback or something similar?